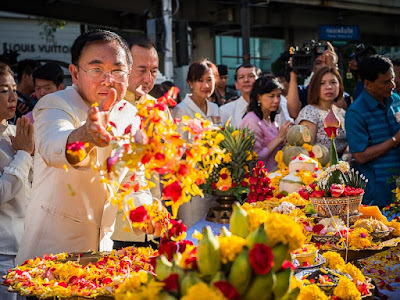 The Minister of Culture sprinkles flower petals around the Erawan Shrine during a rededication ceremony Friday. 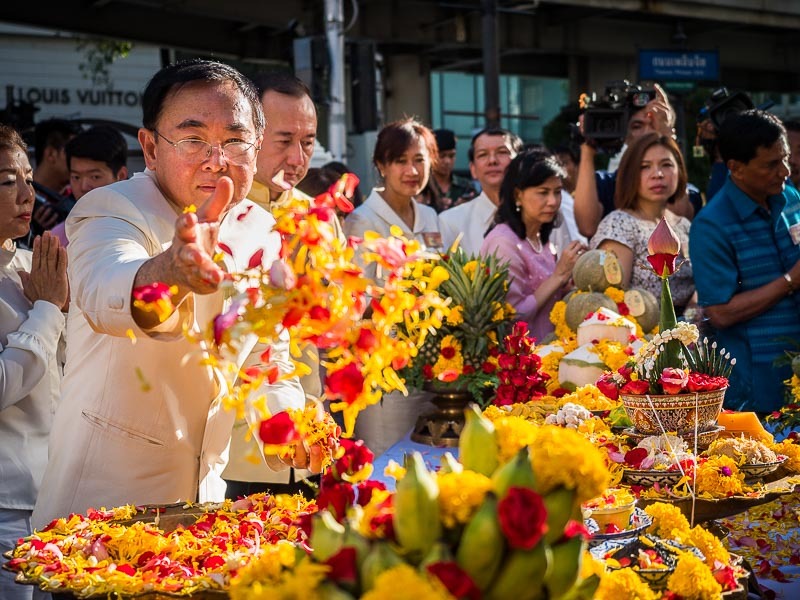 Bangkok's return to normalcy took another step Friday when Thai government officials, Brahman priests and invited guests gathered at Erawan Shrine for a rededication ceremony. Twenty people were killed and more than 100 Injured on August 17 ​​when somebody placed a large bomb near the Shrine. One of the four faces of the Four Faced Brahma was damaged by shrapnel. The Thai government rushed a repair of the statue. The repaired statue was officially revealed Friday. Dancers at the shrine get ready to perform before the rededication ceremony. 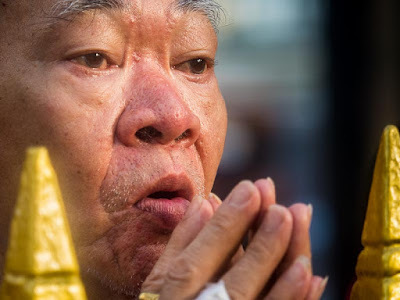 About 50 invited guests and Brahman priests from the Royal Household gathered at the shrine for Brahman prayers and a blessing ceremony and Thai dancers performed and made merit at the shrine. More than 100 people, regular Thais, couldn't get into the shrine and gathered outside the fence and participated privately in the ceremony. People who couldn't get into the shrine gathered outside to pray during the ceremony. 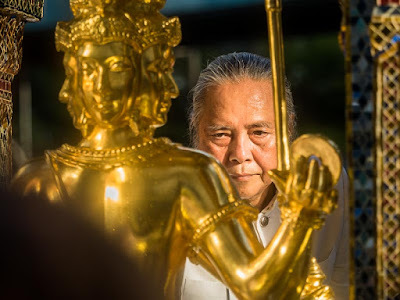 I thought this was an interesting example of the influence of Erawan Shrine. The invited guests were summoned and more or less had to be there. The regular people who came to the shrine, at 6.45AM, they were there because they really wanted to be. The Brahman priest from the Royal Household blesses the Four Faced Brahma statue. 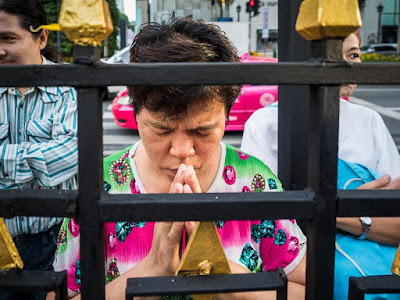 After the Erawan's rededication, people walked to the other shrines in Ratchaprasong (there are Hindu/Buddhist shrines in many parts of the neighborhood) to pray and make merit. I stayed at Erawan for a few more minutes and then left to file my photos to ZUMA. I stopped by Erawan Shrine after filing my photos and there was a large crowd of regular people praying and making merit. 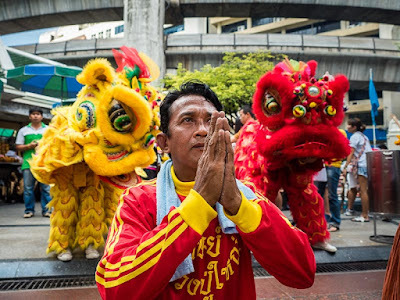 A lion dance troupe makes merit at the shrine after the official ceremony. There was also a lion dance troupe making merit at the shrine. This says something about cultural and religious diversity of Thailand. Lion dancers are a Chinese tradition primarily from Mahayana Buddhism. 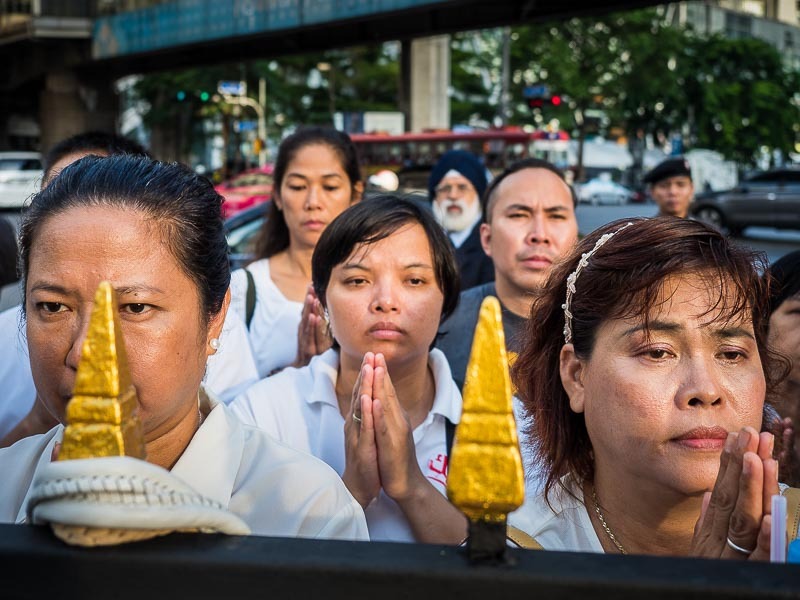 Thais are overwhelmingly Theravada Buddhists. The shrine honors Brahma, a Hindu god. Yet they all come together at this corner in Bangkok's Ratchaprasong district. Thai police have made a number of arrests of people allegedly involved in the attack. They've issued arrest warrants for others not yet in custody. But we still don't know who masterminded the attack and paid for it or whether or not other attacks were a part of the scheme. There are more photos from Friday's ceremony and related to the bombing in my archive.